Silicon Valley is an expensive place to live. It suffers from the tech tax. The high cost of housing compresses disposable income. As a result, homes look a little more worn, cars motor around with dings and dents, and people look a little frumpy and disheveled. Strategically situated in the epicenter of technology, you have the privilege of buying $2 million teardowns on busy streets and the opportunity to gaze wonderingly at roving herds of tech talent. But that talent can be mighty. Engineers, like most people, don’t like to commute. And even inside Silicon Valley, location matters. At the bottom, you have hardware platforms, including items such as computer processors, network routers, and storage arrays. As you move up the stack, you have software platforms, such as Apple’s Mac OS or iOS operating systems, which mask the complexity of disparate hardware components. One more level up, you have databases such as Oracle, the data engines that power today’s complex applications. And at the top of the stack, you have front-end apps that interact directly with end users, such as enterprise resource planning (ERP) solutions and the apps on your phone. In the physical world of Silicon Valley, Highway 280 and Route 101 create an artificial island between San Francisco and San Jose. The first hardware giants such as Intel, HP, and Cisco emerged in the South Bay. As the computer hardware industry matured, it gave rise to the next level in the systems stack: software platforms. 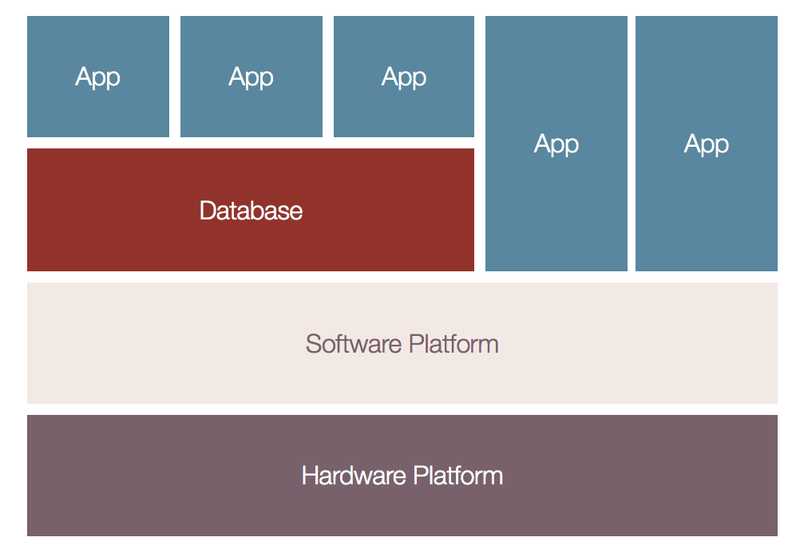 As software platforms matured, they gave rise to the next level in the stack: databases. And as databases matured, they gave rise to more and more complex apps. Each layer unlocked the next over time. San Francisco drew the new layers toward itself like a magnet, which resulted in a funny thing: Silicon Valley laid itself out like a systems map. Hardware companies such as Intel, Cisco, and Apple sit at the bottom. Software platforms such as VMware, Facebook, and Google sit one layer above them. 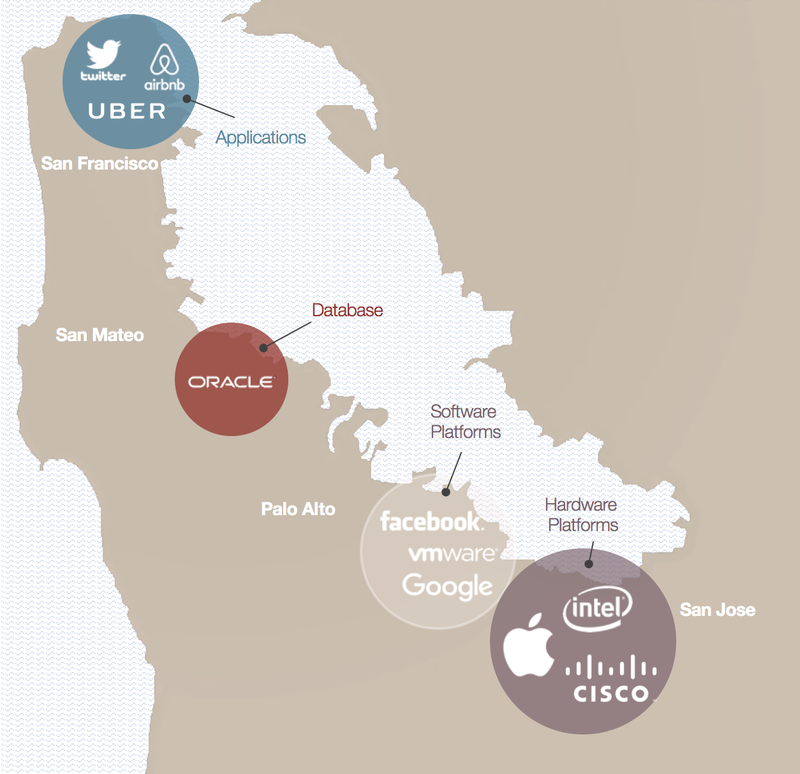 The world’s greatest database company, Oracle, comes next, between San Francisco and the South Bay. And more and more app companies emerge in San Francisco every day, including Uber, Airbnb, and Twitter. Over the last decade, apps have become more and more leveraged, enabling the Ubers and Airbnbs to grow into incredible industry killers overnight. As a result, a major demographic shift has occurred. Talented young engineers want to work where all the hot app companies are headquartered. And they want to live in a big city. The bigger the pool of talented engineers, the bigger the pool of new, innovative companies. It’s a virtuous cycle that has made San Francisco the new heart of Silicon Valley and the virtual capital of the developer world.